Frauds, myths, and supposed mysteries about humanity's past are moving targets for anyone committed to the scientific investigation of human antiquity. It is important for anyone interested in the human past to know, for example, that there is no evidence for a race of giant human beings in antiquity and no broken shards of laser guns under Egyptian pyramids. Debunking such nonsense is fun and useful in its own way, but more important is the process by which we determine that such claims are bunk. 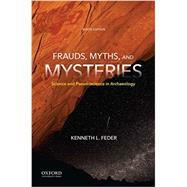 Now published by Oxford University Press, Frauds, Myths, and Mysteries: Science and Pseudoscience in Archaeology, Ninth Edition, uses interesting--and often humorous--archaeological hoaxes, myths, and mysteries to show how we can truly know things about the past through science. It is not just a book about how we know what isn't true about the human past--it's also about how we know what is true. Kenneth L. Feder is Professor of Anthropology at Central Connecticut State University. He is the author of several books, including The Past in Perspective: An Introduction to Human Prehistory, Seventh Edition (OUP, 2016), and Linking to the Past: A Brief Introduction to Archaeology, Second Edition (OUP, 2007). Where Do Hypotheses Come From? Chapter 5. Who Discovered America? A Chinese Discovery of the New World? Other Europeans in the New World Before Columbus? Mystery Hill: A Convergence of Evidence? Other Evidence of the Viking Presence? Extraterrestrial Aliens in the Pacific? Chapter 10. The Mystery of Ancient Civilizations: How Did People Get So Smart? A Lost Civilization? But It's Not Atlantis. Well, Maybe It's Atlantis.